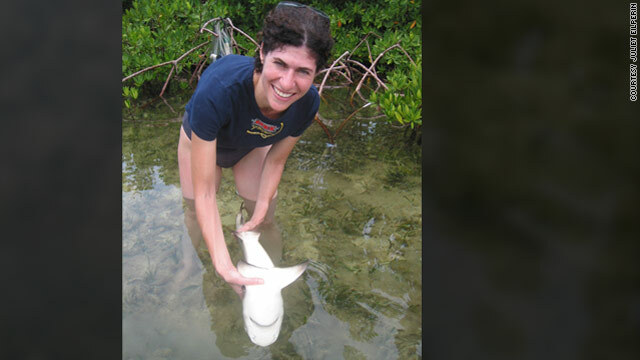 Author Juliet Eilperin is holding a juvenile lemon shark, which becomes hypnotized when upside down, in Bimini, Bahamas. Juliet Eilperin is the national environmental reporter for The Washington Post, where she writes about science and policy in areas ranging from climate change to oceans. It took three years of traveling to nearly a dozen countries across the world—from Africa to Asia, as well as Europe and Latin America—and diving with sharks, often without protective gear, to complete research for the non-fiction. She recently talked to CNN about why our culture is obsessed with sharks. Why did you decide to write about sharks? I’ve been interested in the ocean for a while, since I see it as one of the last great frontiers. I wanted to write about it in a way that was compelling to people, and I thought sharks were a great way to do that. They’ve been around for hundreds of millions of years, yet they’re still mysterious to us. You’re not the only one fascinated with sharks—Shark Week on Discovery Channel wraps up today, and people are obsessed with this program. Why do you think people are so interested in sharks? The fact that they can strike us without warning is part of what makes them so fascinating to people. They’re also so alien in many ways—some of them are constantly on the move, with their mouths agape, and they have these extraordinary ways of sensing their prey—that we’re intrigued by that as well. You traveled and dove with sharks around the world while writing this book. What was it like being surrounded by sharks in the water? The only place I went down in a cage was off South Africa’s Eastern Cape, when I was in the water with great whites. Other times I was swimming with less lethal sharks. At first I was nervous, but over time I got used to being in the ocean with sharks. What I was struck by was how indifferent the sharks were to me. I was really an afterthought, from their perspective, so I could just sit back and enjoy the show. You explore the human-shark relationship in your book. How do different individuals (scientists, fishermen, chefs, etc) and cultures relate to the ocean’s top predator? It really depends on who you’re talking about, since it varies. Several island cultures used to worship sharks and some, like Papua New Guinean shark callers, still do. Some New England fishermen are quite hostile to sharks, they see them as competitors. In China, consuming sharks is a status symbol, and in some parts of America, killing them makes people feel powerful. Meanwhile, many scientists see them as vulnerable creatures. So there’s a huge range of views. What is the most interesting thing you’ve learned about sharks? I was most surprised by the fact that we share an evolutionary bond—the muscles we use to crew and to talk, as well as the bones in our inner ear, come from sharks. That’s pretty mind-blowing. The muscle we use to "crew" and talk or chew and talk? Perhaps screw and talk? If there is a chance of life on any planet I bet there would be living beings existing already!!! My guess is if there are no living beings on a planet, then there is no chance of life on that planet!!! Can we get back on earth and find something useful to do?